Well, summer’s finally arrived. No really. Yesterday was the hottest September day on record and the heatwave is set to continue over the weekend. Not so much the ‘season of mists and mellow fruitfulness’, which John Keats apparently wrote on 19th September (in his poem ‘To Autumn’), but a time to bring out the barbies and bikinis. It’s been a funny old year for weather, which is affecting various crops in different ways. We had a terrible year for tomatoes as the damp, warm weather meant the plants got very mouldy. But apples are apparently early and yielding well. And while it may seem natural to hit the beach in all this glorious sunshine, it is actually autumn and there’s nothing better to do on a nice autumn day then spend a quiet hour picking blackberries. Blackberries are a true superfood as they’re very high in antioxidants, vitamins C, E and K as well as manganese. And they’re free! Folklore dictates that you shouldn’t pick blackberries after Old Michaelmas Day, 11th October, as the devil has been doing unpleasant things to them! The date at least probably makes sense, as by then the fruit may have been affected by mould. So get picking over the next few days. Another wonderful thing to do in the autumn is to make chutney. Storing up some of summer’s sunshine to be brought out in the depths of winter is very satisfying, and bubbly cheese on toast topped with chutney is a great comfort food! I may leave further chutney making ’til the hot weather’s over, as it’s also a lovely activity for colder days! But I now have a store of blackberry and apple chutney tucked away in a dark cupboard ready to be brought out when winter really does kick in! 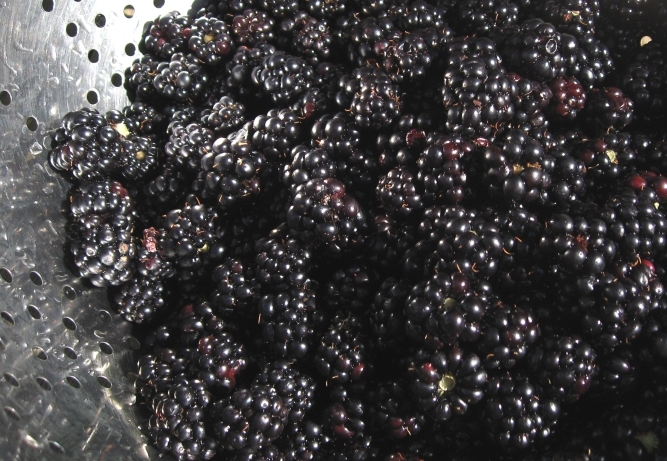 Thoroughly wash the blackberries and put them in a heavy bottomed saucepan. Prepare the apples and onions by chopping them finely or mincing them in a food processor. Put them into the pan with all the other ingredients except the sugar. Bring to the boil and simmer for around 20 minutes to allow the fruit to soften, then add the sugar. Leaving the pan uncovered, simmer the chutney until it thickens. This should take 1 to 1 ½ hours. Meanwhile heat some clean jars in an oven set at 100˚C for at least 10 minutes to sterilise them. Pour the chutney into the jars and seal straight away. The chutney is best left for at least 2 weeks before eating, to allow the flavours to fully develop. *My hollyfoods range of chutneys and jams are for sale in Par Ici in Twickenham in west London. Under the Lime Tree is a vegetarian guest house in the Charente region of France, specialising in spa breaks and pamper days, as well as gorgeous vegetarian food. Nikki Emerton, one of the owners of the guest house, now has a cookery book out featuring recipes developed while running Under the Lime Tree. I came across this recipe from the book in The Vegetarian magazine and knew it just had to be tried. The combination of bananas and chillies was a new one on me (and on many people I’d have thought! ), and it certainly worked, giving what would otherwise be a fairly plain dessert option (bananas and ice cream) some much needed pep! I used a chopped dried chilli which was probably hotter than a sprinkle of chilli powder, but that was calmed down wonderfully by a delicious vegan ice cream. The option is given to use either maple syrup as I did, or caramel sauce, which I imagine would give a very different flavour, but one that would go really well with the bananas. Peel and slice the bananas into a bowl then squeeze the lemon juice over to prevent them from discolouring while you make the sauce. Drop the knob of butter into a pan and gently heat through. Add either the caramel sauce or maple syrup, then the brown sugar and stir well. you may need a dash of water if the sauce appears too thick. Add the sliced bananas and mix in without breaking up the bananas if possible. Srpinkle with hot chilli pepper – sparingly, stir in, then serve immediately with vanilla ice cream.